Mari Keski-Korsu is a transdisciplinary artist who often explores how ecological and socio-economical changes manifest in everyday life. She has been working on a project based in inter-species communication, and during the Pixelache festival she is presenting (in collaboration with the writer Pipsa Lonka and the movement artist Eija Ranta) the Alpaca Oracle. 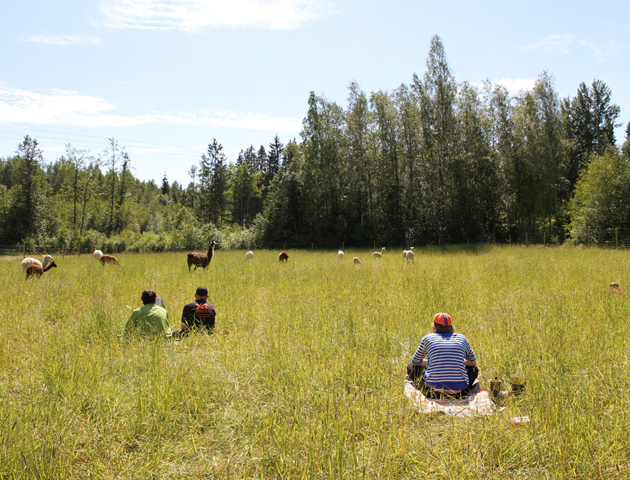 Alpaca Oracle investigates what humans might learn from the animal world, in this case a herd of alpacas at Alpaca Fuente Farm in Lohja. Festival attendees who wish to participate can sign up and come along - we are providing a free bus trip there and back. We asked Mari (who is also the current chairperson of Pixelache) some questions about her motivations and practice. Pixelache: Maybe this is a question for us as organisers instead of you as artists, but -- I think the biggest question we are likely to get is "Why, in a festival that is explicitly talking about Helsinki as it's purview, are we getting on a bus for an hour to leave the city?" Mari Keski-Korsu: The strict borders in-between urban and countryside are questionable when you think of how people live. In Helsinki, one needs to bicycle just a short while to be in the middle of the forest or agricultural field. Most of the people living in Helsinki or any other urban area have moved there from somewhere else. Also, vast amounts of people commute to towns from rural areas. What I'm trying to say is that a place has many levels, one being the geographical, obviously but really, we also carry the places in us. On the other hand, we could have brought some alpacas to Helsinki, but it wouldn't have been fair to them. Instead, we go to meet them at their home and as their visitors. Alpaca Oracle, 2014. Photo: Jenni Valorinta. The Oracle is part of a larger focus in your work on inter-species communication, a true trans-disciplinary project for sure. You are artists, but require an animal communicator (Maiccu Kostianen) to collaborate. Have you encountered any difficulties from these different backgrounds? When working with people who don't come from an art background, one is somewhat shut off from the endless analysing, criticising and reflecting that is usually done in the field. It can be refreshing. Many times it comes down to very practical discussions - what does this all mean? A different kind of background could bring difficulties, but I have worked with so many people who come from so many different fields, and in the end, have never really had any major problems. We all have our enthusiasms, and working with those together is fullfilling. There just needs to be an interest and curiosity for collaboration. You've talked about empathy as the centre of your practice. Do you feel that empathy is something intuitively understood across species, or is it a distinctly human invention? In what ways do you feel empathy is a radical act? Sure, it's possible to think of other species feeling empathy. For example, elephants mourn their passed ones and have a cemetery for them. But on the other hand, a cat doesn't understand or care about the pain of a mouse it's playing with, and I don't place morality or ethics in that. So in the end, I don't care so much about other species having empathy or not, even though we can learn from them -- but I care about the human species having empathy. We humans need to research if some other species or even human babies are feeling pain in order to justify our empathy. This is insane. I understand that empathy can be explained trough evolution biology - it's worthwhile to read and understand what your enemy is feeling. But I think this should be seen in another level; empathy and compassion could really save the whole human species. If we can learn to be empathic and compassionate and teach our children to be so (much of the empathy is learned) towards everything around us, not only other species but all ecosystems, we can change the course and start existing in a respectful and balanced way. One very concrete example, is to go to the Helsinki agriculture fair on the day when all the school classes are there. The exhibition centre is full of kids of different ages who run around screaming around the other animals cages, stick their hands into the cages, and then their smart phones to take a picture. Depending on the other animal, you can lose your hand or just add to the horror and fear they are obviously feeling. It's mayhem. But it's not the childrens fault. No one has given them an example for how to behave and respect or question the circumstances. We live in a society where our kids are taught to be like that - other living creatures being their entertainment - so it's understandable that the animals will keep suffering as we keep destroying the very planet we live on. We don't understand the basics -- that we are animals ourselves, and we are not the centre or somehow above other species. (By "we" I refer to the so-called "Western" countries, or those who are on the top of consuming chain). You worked in Scotland with Clydesdale horses before, in a different Oracle. What surprised you the most about this experience? How did this change your preconceived expecations about the Oracle, and will it change the way you approach the Alpaca Oracle? I grew up with horses and they were my only friends. This already gave me a little different perspective to begin with so it was easy for me to connect with their calm kindness. But with the Oracles, I try to work with any other animals that might be somewhat happy and not abused (even though they are living with humans). The domestic animals have existing, concrete relationships and a history with humans, even though their relationship is not equal. I want to imagine this equality. I'm also interested in landrace species and other herd animals. Humans are herd animals, partly predators, partly prey. The alpacas and the horses are similar thematically, and with the channeling from Maiccu, they have similar things to say from their joined consciousness. But it's obvious that the situation affects the experience a lot and when you are really there, you know. With the horses, I had a more structured form for the Oracle. In some ways this was good, but sometimes it's also good to give people a lot of space - especially with the alpacas, because it takes more time from them to accept the new people around them than with horses. It adds another thing to the Oracle when you can touch the other animal. To sum it up, every species has their special characteristics and this very much defines also the Oracle. Clydesdale Oracle, July 2015. Photo: SSW. The Clydesdale Oracle dealt with the themes of work and labour. Do you anticipate similar themes with the alpacas, or something different? The human participants of the Alpaca Oracle will discuss in groups what kind of things they'd propose to talk about with the alpacas. The alpacas will answer questions if they want to. Quite often they do. I can't tell, yet, if there will be discussion about work and labour but I would be interested in bringing that theme up as the alpacas might have something else to say than the horses. It's also very important to remember to go with the flow and not to force questions or anything. For people who are coming to the farm during the festival, what sort of experiences (physical and mental) should they expect? What sort of preparation should they do before coming? We are all trapped in the ultra-rationalised way of seeing the world. Hopefully, the participants can try to leave that behind for a while and come with an open, accepting mind. It is very easy to criticise telepathy or animal communication, but then again, why not try it? Maybe it's crazy but I'd say the way we are living now is crazier. There is no real connection, otherwise we wouldn't be heading towards extinction. All the environmental problems are very well studied and explained by the science but it doesn't seem to make much difference. It's hard to even first notice our endless dependence and no-way out from fossil fuels. Help is needed. The communication starts from simply emptying one's mind from the endless traffic and taking the time to really listen. Some might call it deep listening. People have always been communicating with other animals or plants, especially indigenous people for example, but all people with pets know this, too. We can practise that muscle that everyone has. At practical level, every participant needs to be accepted to come close to the alpaca herd by two guardian llamas. But all the registered participants will receive tips and information on how to prepare their hair for this and all the other things we'll be doing during our visit. What's next for your inter-species communication work? 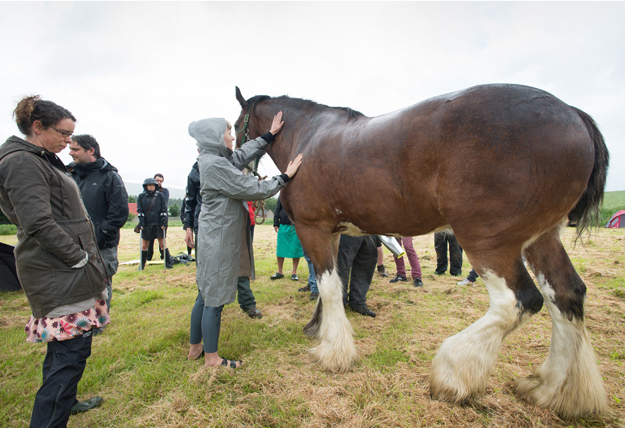 I would like to go back to Scotland to work with the Clydesdales. 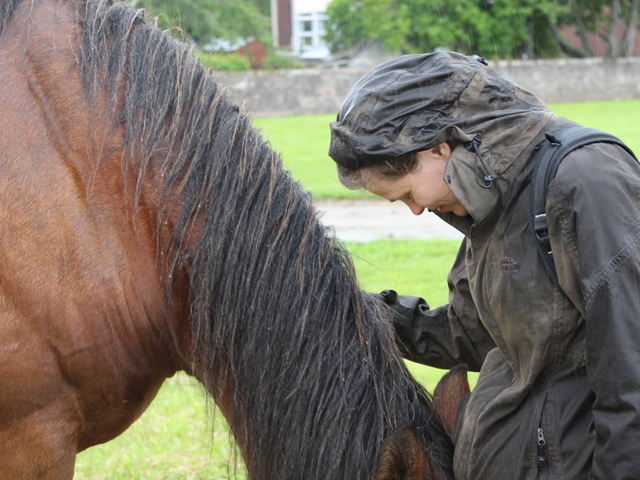 I'm interested in children's points of view and Strathorn Farm Stable, who I've been working with, have been doing animal therapy with kids for very long time. It seems also that I can't get rid of the alpacas and I'm very happy about that. What does the idea of 'Living Spaces' mean to you? How do you feel you are contributing to the concept? I'm not sure what would be a dead space. But I see Living Spaces as an attempt to take over spaces for surprising or empowering use. I think the alpaca farm is a nice addition to this.